This is the sixth edition of an original 1779 map. Differences between this edition and the previous one suggest that the plate was re-engraved, at least in part, as new and proposed buildings have been added. Most strikingly, 20 proposed locations for fire stations are depicted, along with their catchment areas. The Metropolitan Fire Brigade was not formed until 1865. 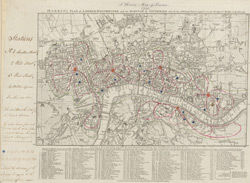 A number of different company brigades had co-operated with each other as the London Fire Engine Establishment since 1833. The failure of this service to stop the destruction of the Houses of Parliament in 1837 led to criticism, increasing when a fire in Tooley Street raged for two days.